1. what would this group recommend, given the above? I am 5'8" and 190 pounds. I prefer stiff and fast boards, rarely ski 'hard bumps', and just want something i can start experimenting with in the deep. my worry with the 82 is that it'll be 'too big' but that the 77 won't perform enough in the crud/pow/back stuff. 2. If the 82s, i imagine the 172 would be fine. In the 77s, i can't make a decision between the 170 or the 177!! Thoughts welcome, and thanks. what do you want out of that ski? Power, energy, float, ease, carving ability, agility? Thanks for the quick response! Weight is about 190 lbs, and height is 5'8". 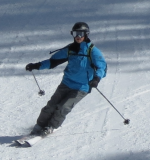 I like to ski fast (not ridiculously so) but am generally a strong and stable skier with solid technique. What I want out of a ski is something that I can use on the trails (not just use, i guess, REALLY use) but that can also function off-piste. For trail skiing, i like nothing better than big sweeping GS turns on something steep, but not outrageously so. I also enjoy the short turns on occasion. But what I really want to do this year is LEARN how to ski off piste. Switzerland is not Utah; there are very rarely the big champagne pow days, but I know an average day is in mid-weight powder possibly knee high, or a bit more. More likely to be encountered is the heavier crud by the end of the day. Power, energy, float, carving ability, agility, and ease (in that order, if i had to choose). I'm comfortable with a 'hard' ski, though have never used a ski quite so wide as the mid-fats. Skiing terrain will most likely be 50% trail, and then mixed pow and crud. No bumps! (at least, not a real driver for me). And, finally, I tend to ski more old style but am working on edging technique a bit more.. So, i guess the best way to sum up is I'm not the smalles guy in the world, but I ski strong and aggressive, I love the groomed, can make a big ski turn, but also enjoy the quickness on groomed, go fast, but want to really move into learning new off piste (crud/pow) techniques to open up new doors. So, in your opinion...1. do i go with the I.m 77 or bump to the 82s? And if the 77s, should I get the 177 length, or the 170? Well, Gary will probably say different but I am going to say that based on you being a bit more aggressive and hard charging, and liking a stronger ski, I would go for the 82. At 5 8' I would stay with the 172. I am 175, 6' and ski the 172 it's very stable. I don't get to take it into any real powder so I don't need to max out the float. Now, having said all this, the 77 is still a great ski and will serve you well. The 82 is just a bit more lively and energetic. It has vertical side walls-laminate construction so its just a bit more of a ski. If you have cash, i would get the 82. I am 5'11 and around 200 and ski the iM77 chip at 170, and would recommend 170 for you as well. The link is to a review by Dawgcatching (Scott) over on Epic. We all trust him (I bought my iM77's from him, Ron has bought skis from him). His reviews are what should be in the magazines as far as describing his skiing and his ability and this is one of the best as far as comparing and contrasting these skis. Yes, I came upon that review myself yesterday, but thanks for the link. Agreed that a) this is a fantastic review and b) that all reviews, ideally, would be like this. I don't think I'll get a better summary than that! And now having said that, and listened gratefully to all the people on this board, I think i will be sticking with the i.m 77 for now. I am not yet skilled enough off-piste to warrant the fatter board and it sounds as if the 77 is the better learning tool, at least for me. I think that practicing in the crud is a good place to start, and then we'll go from there! If people are ever interested, I'll probably bore everyone to death with my updates as soon as the snow starts (whoo-hoo). Think white!